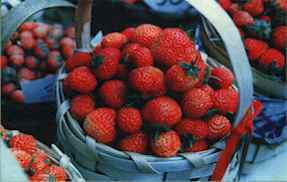 Ottoman Strawberry is produced from the European Arnavutkoy Strawberry. It's a rare plant which only grows in Karadeniz Eregli. With its pink colour, oval seem, rich aroma and excellent smell, the Ottoman Strawberry is unique. In the beginning of the 1900's, the Arnavutkoy Stawberry which was given as a present to Halil Pasa for its beautiful flowers cane into being with its meeting with the clayey chestnut soils of Kdz. 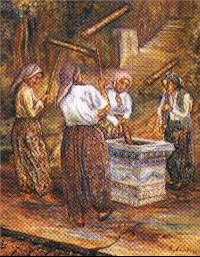 Eregli.The Ot. 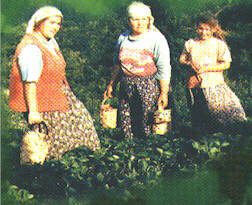 Strawberry hasbeen the most important source of income of the folk of Kdz Eregli for a long time. Mustafa, the driver of Halil Pasa, sawed it for the first time and Yahyaoglu Kadir and his Greek partner made the first production of it on a vast scale on the skirts of Kestaneci Village. Ot. Strawberry, which has an important place in the social and economic life of Kdz. Eregli, is a present which Kdz. Ereglians offer with pride to their foreign visitors. Finally, it obtained the posing of one of the fist can factories of Turkey in Kdz. Eregli. A festival is putting in order to increase the production of the Ottoman Strawberry and to prevent it being annihilated. By the development of indisty Ot. Strawberry lost the peculiarity of source of income.